New Balance is ready to drop a new stunning limited edition boot, as they introduce their latest limited edition Infinite Lite Pack. The Infinite Lite Pack will give the Furon v5 and Tekela v1 a cool whiteout colourway inspired by the centre of the galaxy. The Infinite Lite Pack is the latest colourway for the New Balance boots, as New Balance takes inspiration from the centre of the galaxy, where the design illustrates the creation of stars, which makes this boot perfectly for the players who shine bright on the pitch. 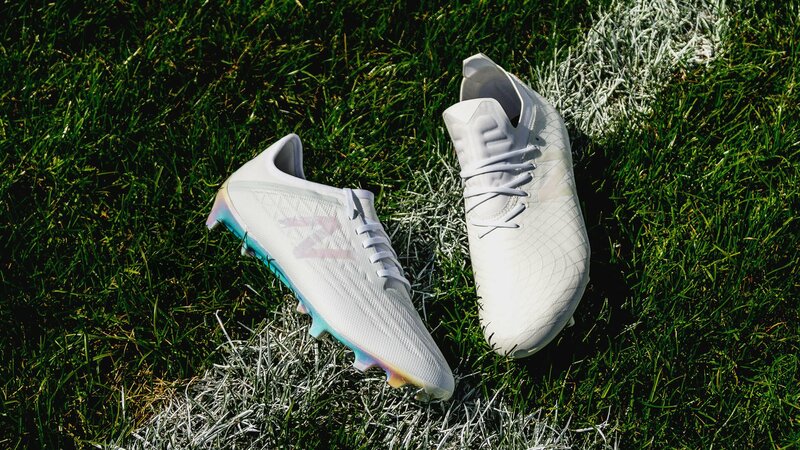 The whiteout Infinite Pack comes with a, funny enough, completely white upper, that features iridescent details, as the football boots illustrates the reaction that creates a star, while the iridescent detail is inspired from the colours that the stars radiate. The iridescent details are place on the New Balance logo and on the awesome soleplate, which is out of this world. You can really see that New Balance has used a lot of energy in making a special Limited Edition New Balance colourway. The Infinite Pack is made to make the Tekela and Furon players spark, dazzle, shimmer and flash on the pitch, while they destroy the defense. You can’t avoid spotting the chosen stars on the pitch as they’re the unstoppable force dominating the game. The New Balance Infinite Lite will be available to order at Unisport from the 13th of April. Be sure to check in tomorrow and cop you pair before it gets sold out. Find the Infinite Lite Pack here.